We really enjoy hitting various happy hours around town. 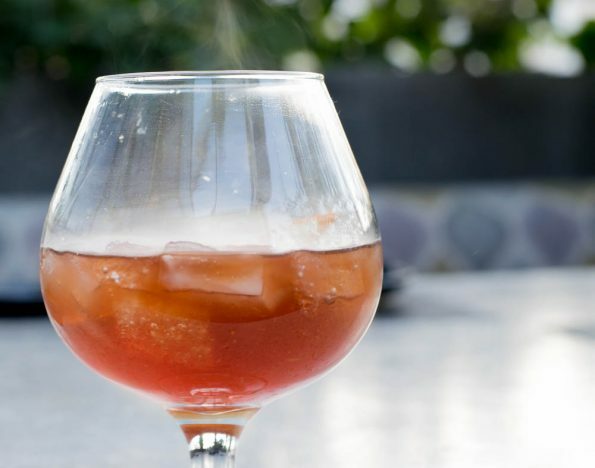 Not only is it a great way to get a great deal on drinks but it offers an opportunity to try the menu at a restaurant that you may either find too expensive or are unsure of and don’t want to commit to entrees. Neither was the case for us when we tried out Sushi Roku (we already knew how amazing their food was from various food events), but we hadn’t been to the restaurant for happy hour so we decided to give it a go. It didn’t hurt that they recently released a new cocktail menu! Happy hour is nothing without cocktails (the cocktails we tried were primarily off of their new cocktail menu and are not featured on the happy hour menu), and the cocktail offerings at Sushi Roku are nothing to balk at. We tried the Down the Rabbit Hole (Bulldog Gin, Muddled Lemon & Mint, Carrot Juice, St. Germain Liqueur, Honey Simple Syrup; Garnished with Mint Leaf), The Black Mamba (Bulleit Rye Whiskey, Hitachino Espresso Stout, Cocchi Rosa, Muddled Mint & Orange, Agave Nectar, Lime Juice; Garnished with Mint Leaf) and their take on the Old Fashioned. All three cocktails tasted fantastic and what was great about them is their uniqueness. Even the Old Fashioned was different which had a more smoky flavor (heck it is served smoking!). 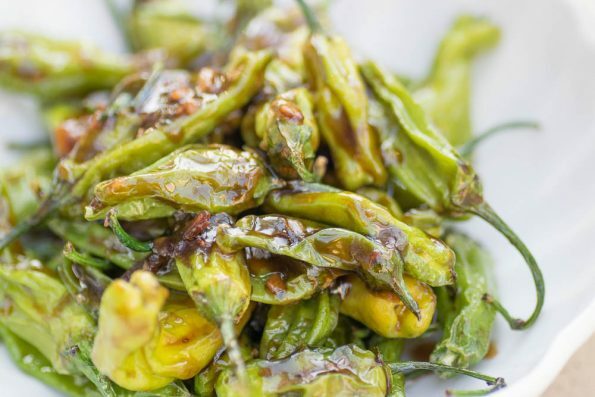 Shishito Japanese Peppers- While you might think that these are fairly simplistic compared to a lot of the beautiful food served at Sushi Roku, the flavor of these peppers make them a must order. Served blistered and with oyster sauce, we promise you can’t eat just one! Toro & Jalapeno Roll- This roll is the essence of good sushi. The ingredients are simple but it still has a big and complex flavor. The fish is so fresh that you actually find yourself not wanting to put anything on it (even soy sauce). 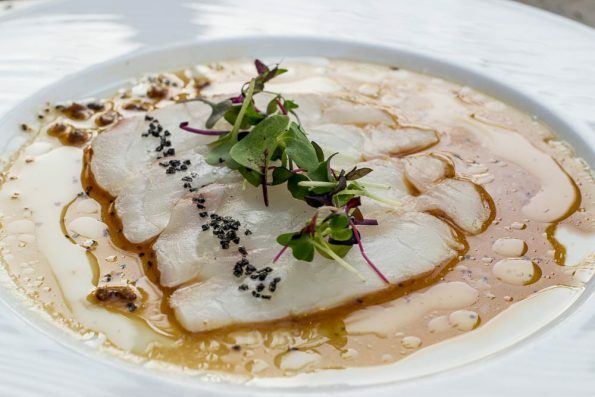 Seabream Sashimi- The seabream is served with ponzu, lava salt, and micro greens. It has a super mild (not fishy) flavor that has notes of citrus from the ponzu. The lava salt adds that next level of flavor with a uniqueness one can only find with lava salt. 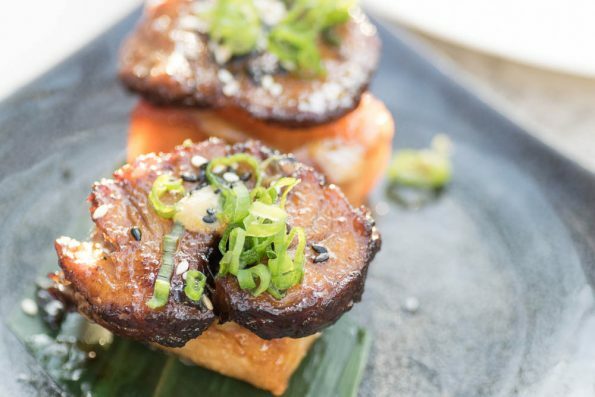 Pork Belly Hanabi- The pork belly hanabi is perfect for the diner who isn’t a fan of seafood but tagged along (or who are we kidding, anyone who loves pork belly). The pork belly is super tender and the crispy rice is the perfect vessel for the pork. 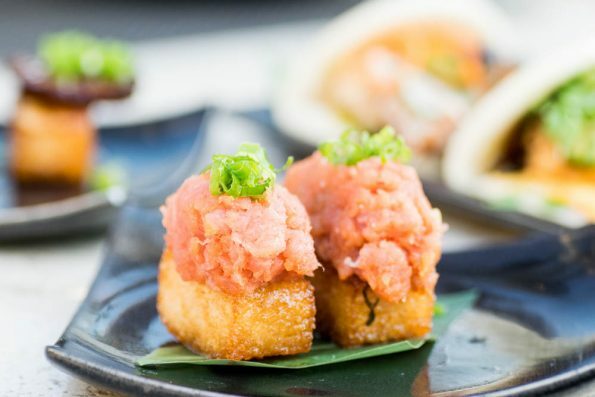 We really enjoyed our happy hour with Sushi Roku and as if our photos weren’t enticing enough, on June 16th they are offering 50% off of their entire food menu during dinner time! Additionally, starting June 17th, locals can get 20% off their order (food and drink; take-out excluded) through Labor Day! So head on over and get some amazing food at a great price! 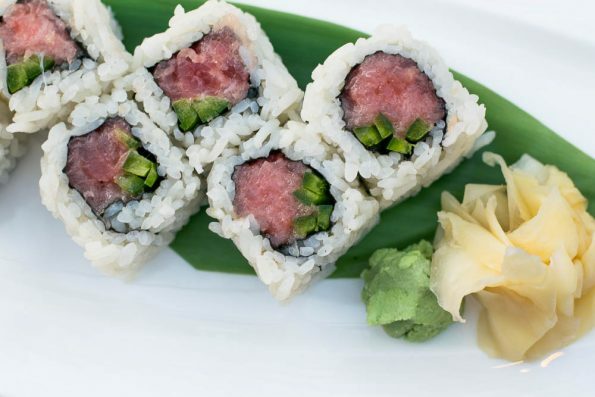 Where is your favorite sushi spot? Why do you love them? We’d love to know! Leave a comment below or use the hash tag #GeekEats! I love those shishito peppers and the pork belly. Will have to try that seabream next time!